This page contains surface textures for the planet Mars and its moons. Note: Some maps may need to be realigned for accurate use within Celestia, such as north-south / east-west (180 degree) rotation or longitude / latitude alignment. A low resolution model of mars with moderate resolution areas of the Valles Marineris and Olympus Mons. Mars surface and normal VT maps. A realistic rendition of Mars, based on the Mars Global Surveyor image catalog MOC2-143. An alternate texture of Mars showing the canals as imagined by Percival Lowell and Edgar Rice Burroughs. 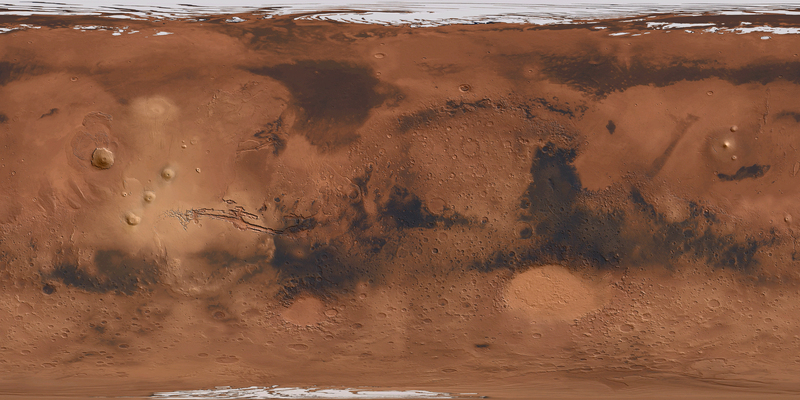 8K DDS Mars Surface Map. 32K VT Mars Surface Map. Mars Surface Feature close-up models. Provides higher levels of detail for Olympus Mons. Provides enhanced surface details for Martian Water Ice features. Virtual textures of the Valles Marineris.